Today’s song is a somewhat forgotten British Invasion classic from 1965, featuring future members of The Kinks and Argent amongst its band members. Unit 4 was a British harmony vocal group that was started in the early 1960s by Brian Parker who was a member of Adam Faith’s backing band The Roulettes. Parker set out to form his own band and recruited Buster Meikle on vocals and guitar, Tommy Moeller on vocals and piano and Peter Moules on bass. Soon thereafter, they added two more members, Rod Garwood (bass) and Hugh Halliday (drums) who became the “+2” of their namesake. Their first British single was “The Green Fields” which was a top 50 hit in 1964. By 1965, they were joined by two guest musicians, Bob Henrit who later went on to become a member of The Kinks and Russ Ballard who was a founding member of Argent. Both had worked with Parker and were also members of The Roulettes. Henrit and Ballard later joined Unit 4 + 2 as full members in 1967. 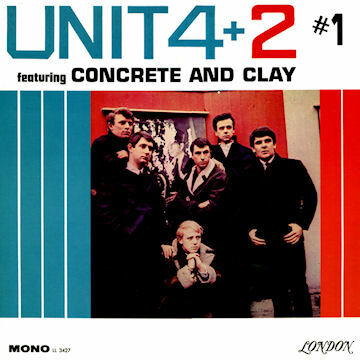 Their 1965 single, “Concrete And Clay” topped the British charts due to its inclusion on pirate radio playlists. In America, Unit 4 + 2’s recording of the song competed on the charts with a rival version by singer and Bob Crewe protégé Eddie Rambeau. Rambeau’s version climbed to number 35 on the charts, while Unit 4 + 2’s made it up to number 28. Both recordings kind of cancelled each other out, so neither was able to attain the attention that it should have. A full length album was rush-recorded and released to capitalize on the success of the single in England, but the material was lacking and attempts to find a suitable follow up single failed to catch fire on the charts. As time went on, the band delved into psychedelic music as they strived to keep up with the ever changing times. During the late 60s, the group with Henrit and Ballard now full members recorded a version of Bob Dylan’s “You Ain’t Going Nowhere” that failed to compete well with the more successful version by The Byrds. “Concrete” was covered by Gary Lewis And The Playboys, Cliff Richard, Martin Plaza (of the group Mental As Anything) who brought the song to the #2 position on the Australian charts in 1986, Randy Edelman who brought the song to #20 on the UK charts in 1976, Kevin Rowland (of Dexy’s Midnight Runners) and They Might Be Giants. The flip of today’s single is a cover of the Victor Young and Edward Heyman standard “When I Fall In Love” which was popularized by Nat “King” Cole and hundreds of other pop vocalists. The group’s cover puts them more into the category of easy listening artists like The Lettermen. All in all, Unit 4 + 2 released 16 singles and two albums in England between 1964 and 1969. The song was rerecorded by songwriter and original vocalist, Tommy Moeller for a UK album in 2011. Moeller was also known as the public face of another British one-hit wonder, Whistling Jack Smith who had a number five whistling hit with “I Was Kaiser Bill’s Batman.” In the U.S. Unit 4+2 are barely remembered for this one great track, which to my ears sounds like a prequel to today’s faux folk groups like Mumford And Sons and The Lumineers. Posted: May 20th, 2015 under Music, Rock, Unit 4 + 2.